Researchers from Taiwan's National Tsing Hua University developed a candlelight-style OLED lighting panel - with a low (1900K) color temperature. To create this device they used four organic electrophosphorescent dyes (red, yellow, green, and sky-blue) that create two emissive layers (blue and orange). The researchers explain that high color temperature can drastically suppress the generation of melatonin (MLT), a naturally occurring hormone (normally produced at night) that is important for the regulation of the body's circadian rhythms. They say that medical experts have called for the development of new lighting sources with low color temperatures, free of blue emission. Currently no electrical lighting device exists with a color temperature below 2000K. 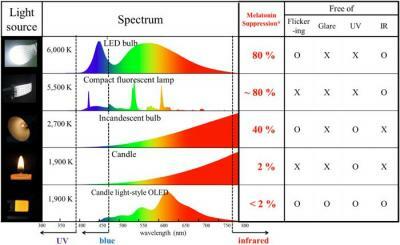 The lowest color temperature is around 2500K for incandescent bulbs. A candle has a temperature of 1910K at its brightest spot. The new OLED device can be tuned to have an even lower color temperature (such as 1800K), for example by reducing the concentration of the blue dye. By changing the thickness of the emissive layer or carrier modulation layer, the color temperature can be modulated between 1600 and 2600K. The OLED panel does not emit anything in the IR region, which is normally absorbed by the skin and then converted into heat to give a physical sensation. The researchers plan to further maximize the CRI of this OLED device and enhance the lifetime - to make them commercially viable. They also want to collaborate with lighting makes to develop useful products for lighting after dusk.